The 2013 World Championships exploded into life as the opening day ignited the capacity crowd at the colourful Maracanazinho in the vibrant city of Rio de Janeiro on Monday. 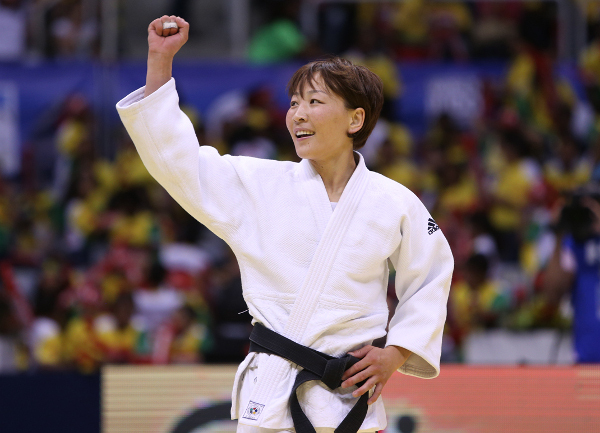 Two world champions were crowned on day one as the women’s -48kg and men’s –60kg judoka took to the tatami to launch the competition which is the first World Championships since 2011 as judo starred at the London 2012 Olympic Games last year. The teeming venue was full of colour and excitement with fans from around the world making the trip to Rio to support their judoka. The home fans set the example with a palpable sense of patriotic hope and pride as they suggested they will their part this week in the host nations anticipated success. Before the final block, delegates from the Brazilian Judo Confederation and the International Judo Federation took to the stage for the opening ceremony. There was also a special performance by 20-year-old carioca and crowd favourite MC Anitta who sang a rousing rendition of the Brazilian national anthem. That was preceded by a majestic aerial gymnastic routine and a duet from acclaimed artists Marcel PAVEL and Irina NICOLAE. Hosts Brazil experienced mixed fortunes as Olympic champion Sarah MENEZES (BRA) recovered from a semi-final defeat to win bronze while Oympic bronze medallist Felipe KITADAI (BRA) crashed out in his first contest. Paris Grand Slam bronze medallist MUNKHBAT Urantsetseg (MGL) produced the performance of her career to defeat former world champion ASAMI Haruna (JPN) in the -48kg final. MUNKHBAT sealed the win by juji-gatame to claim gold to the delight of the Mongolian team in the stands who the newly-crowned world champion immediately acknowledged with a smile and a wave while her coach cried with tears of pride. ASAMI overcome Olympic bronze medallist Charline VAN SNICK (BEL) in the semi-final by a waza-ari while MUNKHBAT shocked Olympic champion Sarah MENEZES (BRA). The home judoka showed no signs of the weight of expectancy on her young shoulders until the semi-final where her best attacks were resisted by the durable Mongolian and time ran out on her dream of winning her first world title in front of her home fans. MENEZES lost by two yuko scores as she failed to trouble the scoreboard with only a drop seoi-nage attempt with 20 seconds left coming close to scoring. The first medal of the 2013 World Championships was won by VAN SNICK who defeated Paris Grand Slam bronze medallist Maria Celia LABORDE (CUB) to clinch bronze. After LABORDE received a shido for avoiding attacks by going outside the area her Belgian rival sensed a shift in power. A neat transition in ne-waza culminated with VAN SNICK submitting LABORDE with a ferocious juji-gatame. The second bronze medal was won by MENEZES (BRA) as she atoned for her surprise semi-final defeat by besting KIM Sol Mi (PRK) to win her first senior world medal. Both judoka had two shido penalities to their name with 15 seconds left and with the scoreboard untouched the contest looked destined for golden score. However, MENEZES ensured no extra time would be required as she threw KIM with a yoko-guruma with one second left to bring the crowd to their feet. Japanese sensation TAKATO Naohisa (JPN) ended Japan’s 16-year wait for a lightweight world title as he defeated Baku Grand Slam winner DASHDAVAA Amartuvshin (MGL) in the -60kg final. Three-time Oympic champion NOMURA Tadahiro (JPN) was the last judoka from the land of the rising sun to win a world title as he took gold in 1997 in Paris. A drop seoi-nage was initially awarded as ippon for 20-year-old TAKATO but that was swiftly amended and replaced with no score so the action resumed. Both judoka were appearing in their first World Championship final and TAKATO stole the spotlight as he won his the senior version of the world title having won the cadet and junior crowns in recent years. TAKATO won by shido scores having only earned one penalty while DASHDAVAA had two to his name. The new face of Japanese judo had tears of joy as he stood on top of the medal podium with the Japanese anthem playing as his landmark achievement sunk in. The semi-final saw TAKATO face a fellow young Asian starlet in 21-year-old KIM Won Jin (KOR) in a mouthwatering clash. The Japanese ace took control of the contest with a waza-ari and a second from a yoko-guruma earned him wazari-awasette-ippon. 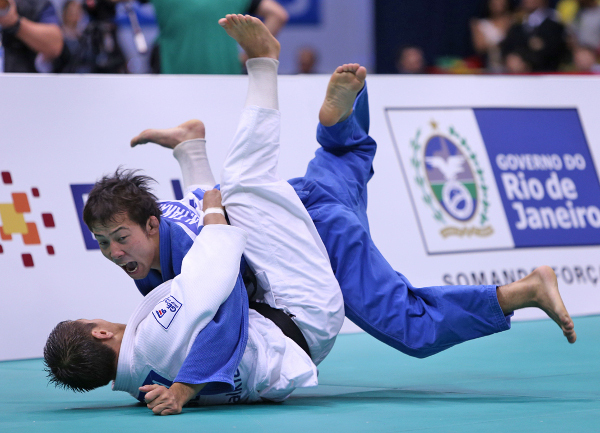 At the same stage DASHDAVAA bested European champion Amiran PAPINASHVILI (GEO) as a ko-soto-gake merited a waza-ari which proved enough for victory. London 2012 Olympic bronze medallist Felipe KITADAI (BRA) was stunned by FISU Universiade bronze medallist KIM in his first contest. The out-of-sorts Brazilian was second best against the impressive Korean KIM who silenced the crowd by protecting his waza-ari advantage and progressing to the next round. 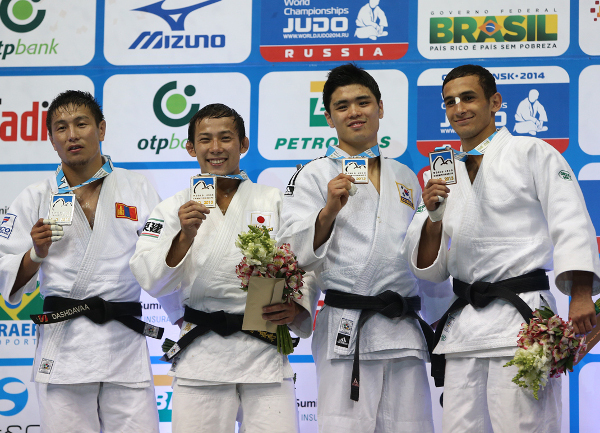 The first bronze medal was won by KIM who outfought World Judo Masters silver medallist GANBAT Boldbaatar (MGL). KIM scored with a harai-goshi with a minute left and that waza-ari was the difference after five minutes of high-quality judo. The second bronze medal was won by European u23 Championships bronze medallist Orkhan SAFAROV (AZE) as he upset Georgian kingpin Amiran PAPINASHVILI (GEO) who suffered a torrid day in Rio. SAFAROV scored with an ouchi-gari with a minute left for ippon.